Community Service Project Grants: The NJPA Foundation identifies exemplary programs that provide psychological services to those who cannot afford it and trains doctoral students to work with these underserved populations. We invite applications from programs across the state of New Jersey, with the goal of identifying and supporting model programs from each county. Read more about the programs we are currently funding. • The John M. Lagos Award for Research Into Causes and/or Treatment of Social Problems ($2,000). Some possible topics include school issues, work problems, health issues, and aggression. 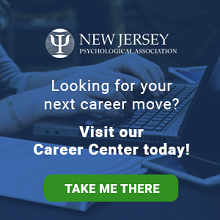 • The NJPA Foundation Scholarship for Research on Diversity Issues ($2,000): Awarded to a graduate student in psychology who advances the following goals: (a) promote scientific understanding of the role of diversity in psychology; (b) foster the development of sensitive models for delivery of psychological services to diverse populations. Some possible topics include issues related to cultural or ethnic issues, socioeconomic issues, gender issues, or work with underserved populations. • The Dr. Zellig Bach Award for the Study of the Family ($1,000). Awarded for the study of behavior related to divorce, teenage pregnancy, adoption, single parents with dependent children, interpersonal abuse, substance abuse, custody, dual careers, childcare, etc. • The Winifred Starbuck Scott Award ($1,000). Awarded to a graduate student in school psychology for completing a distinuished project, usually during internship. Grant amount: Up to but not to exceed $300.00 for conference/workshop related expenses (travel, housing,registration). Awarded amounts are determined on a case-by-case basis. Under certain circumstances, grant amounts may be increased with approval from the board. A limited number of awards are available per year. Previous recipients are eligible, but priority will be given to first time applicants. Applicants are encouraged to apply well in advance of the conference, workshop, or other sessions. Decisions on applications received will be made at Foundation Board meetings, held quarterly. Deadlines for applications are one (1) week prior to Board meetings; applicants will be notified of decisions by the following Friday. Contact the NJPA Foundation at [email protected] for the Board meeting schedule. Won’t you help us help support the psychological well-being of children in foster care programs, adolescents receiving treatment for abuse, and other mental health challenges and ensure graduate students continue to receive the necessary training required to meet the needs of this population?